Book a stay for at least 2 consecutive nights and receive a 20% discount off our best available rate when you book at www.ramada.com before December 31, 2013. Plus, in addition to saving 20%, you can also earn valuable Wyndham Rewards® points or miles for your stay! 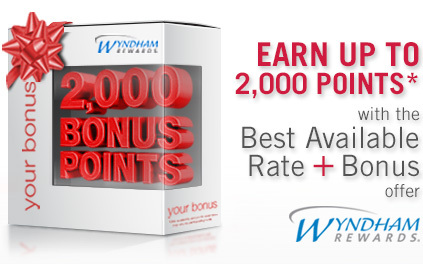 Wyndham Rewards members just need to book a qualifying stay at a participating hotel for their next trip and they can earn up to 1,000 BONUS points. Not a member yet? Don’t worry! Joining is easy and membership is completely FREE! To take advantage of this Best Available Rate + Bonus offer, just click here to join. Ramada Worldwide – You do your thing, and leave the rest to us®. For detailed terms and conditions click here.